At 11:30, the euro zone will publish an indicator of investor confidence from Sentix in April. At 15:15 Canada will present data on changes in the number of bookmarks of new foundations for the month of March, at 15:30 - on permits issued for the construction of change in February. At 17:00 in the US will report on factory orders for February. In Asia, EUR / USD traded with slight increase. 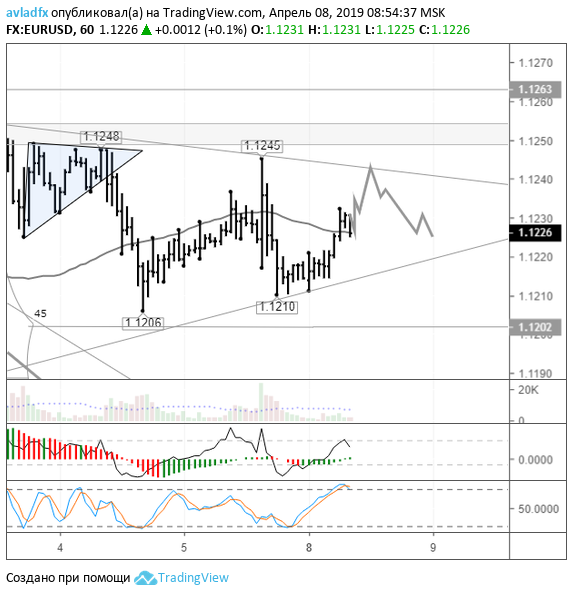 The EUR / USD is on the balance sheet line (1.1225) in the middle of the triangle formation. On the waves is not a triangle, so for me it's formation, rather than a continuation of the trend. From the line lb price can take any direction. Probably the EUR / USD pair continues to trade in a range. According to the forecast EURUSD considered strengthening of the EUR / USD to 1.1243 followed by a decrease to the level of 1.1226. The growth of EUR / USD - correction to Friday's fall. Surprised that Peyrolse price EUR / USD did not exceed the limits of the price range on Thursday and did not reach 45 degrees. Market participants are worried now, apparently, something else. Uncertainty has Brekzit. Also pay attention to the fact that the US president, Donald Trump is trying its verbal intervention to weaken the dollar. On Friday, he said that the Fed should return to the policy of quantitative easing. Under mitigation policies he meant lowering key interest rates and the termination of the process of reducing its balance sheet. The cycles get price breaks down on Tuesday (tomorrow need to be counted), and on the wave structure - up.